HIV self-testing is a new way for people to test for HIV. In the past, individuals could only be tested for HIV at a service. Self-testing allows individuals to test in a variety of settings including their own home. HIV self-testing is when an individual tests themselves for HIV using a kit designed for personal use. A person takes their own blood sample and performs a simple test then reads their own result. 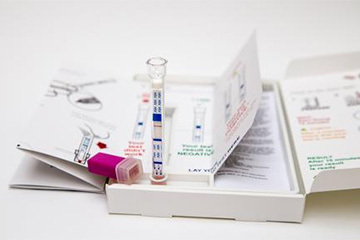 HIV self-testing does not give a positive diagnosis - any HIV self-tests with a positive result must be confirmed by a health care professional. What is the difference between HIV self-testing and HIV self-sampling? Confusingly, HIV self-sampling and HIV self-testing are both sometimes called home testing. However, there are clear and important differences. When someone uses HIV self-sampling, they take their own sample of blood or saliva and post it to a lab, which conducts the test and sends them the result. When someone uses HIV self-testing they take their own small blood sample, perform a simple test then read their own result. Where can I buy an HIV self-testing kit? If you would like to purchase HIV self-testing kits privately you can do so from the BioSURE website. The Terrence Higgins Trust has a page about HIV self-testing. NAM has a fact sheet on HIV home-testing.